Mathilde Moreau Epouse Kouassi carried a large bag of tree bark from her home in the Ivory Coast, to Shenzhen Fine Art Institute, where she spent two months last year, to explore new ways of painting and Chinese calligraphy. The African artist fell in love with Chinese painting and calligraphy while studying Chinese at Beijing Language and Culture University, from 1998 to 1999. She then did further research at China Central Academy of Fine Arts from 1999 to 2000, and from 2003 to 2005. During her stay in Beijing, Kouassi created a special kind of work that combines Chinese ink painting, calligraphy with the bark of trees grown in her homeland. Last September, invited by China's Ministry of Culture and Shenzhen Fine Art Institute, the 50-year-old Kouassi, who is director of the National School of Fine Arts of Abidjan, returned to China to create more art and put on an exhibition. "I really love China and missed China very much after I went back home," Kouassi says. "Chinese people are as hospitable as my countrymen. I made many friends in China. If the colors of our skin can be overlooked, I think there is no difference between people of the two countries. "Calligraphy is a unique culture from China. It is not only Chinese characters but painting and art as well. It inspired me to paint with brush and bark." Don't cry, don't say anything more and don't think about it too much." "China has given me inspiration to observe, think and create, and I would like to take the power home to share with my families and friends. I feel so lucky to know a people who enjoy life, love culture and like to make exchanges with us," Kouassi says. Visiting Shenzhen Fine Art Institute with Kouassi were four artists from South Africa, Egypt, Kenya and Benin. As a conclusion to their two-month stays in Shenzhen, an exhibition featuring their works ran at the institute from Oct 25 to Nov 20. Their creations combine a rich and unique African flavor with Chinese elements. They won wide acclaim from visitors and Chinese artists. "African artists have a unique sense of music, rhythm and dance. Their works feature a primitive power," says Dong Xiaoming, director of Shenzhen Fine Art Institute. "Contemporary African art is strange for not only ordinary Chinese people but even artists, except for a few experts in African art," Dong says. "These five African artists have brought us fresh ideas of culture and arts from the mysterious continent. 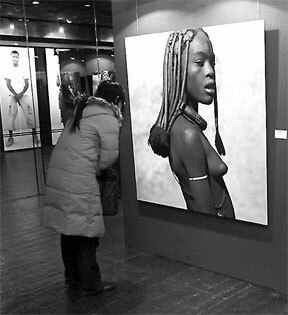 It is the first time that Chinese artists and African artists have had such close communication. We can learn many new ideas and painting skills from them." "Africa enjoys a long history and profound culture and its rich arts have inspired many Western artists like Picasso," says Sun Shenghua, director of Shenzhen Sculpture Institute. "China's mainstream artists have learned much from their Western counterparts since the country opened up to the outside world 30 years ago. Now we need to draw nutrition and resources extensively elsewhere." The five African artists visiting Shenzhen Fine Arts Institute were part of the African Cultural Visitors Program 2008. The annual African Cultural Visitors Program is the fruit of the Beijing Action Plan of China-African Cooperation Forum (2007-09) signed by China and 48 African countries at the Beijing Summit of Forum on China-Africa Cooperation, in November 2006. "At the 2006 summit, leaders from China and African countries discussed important issues together and decided to establish a new type of strategic partnership, featuring equality and mutual trust in politics, mutual benefit and win-win results for their economies, cultural exchanges and mutual learning," says Yu Peng, assistant director general of the Bureau of External Cultural Relations of China's Ministry of Culture. "Ever since the summit, the Ministry of Culture has focused on fulfilling the three commitments stated in the Beijing Action Plan. The first is to actively implement bilateral government exchange programs, the second is to support and promote cultural exchanges at a local level and among the peoples, and the last is to keep up the African Cultural Visitors Program." Hundreds of African artists, government officials in charge of culture, museum directors and curators and arts managers have joined the program. Last October, more than 140 artists and cultural officials from 25 African countries attended the event African Culture in Focus 2008 in Shenzhen. Performing arts companies from Nigeria, Liberia, Tanzania, South Africa, Gabonese and Chad gave shows to local people. And Ghanaian kids who learned acrobatics at Wuqiao, North China's Hebei province performed stunts. Aside from those five African visiting artists' exhibitions, many countries brought artistic folk art to display during the event. Cultural policy-makers from these African countries also attended roundtable meetings on the theme of "domestic cultural policy and external cultural relations". Cultural exchanges between China and Africa have a long history. More than 600 years ago, Zheng He, the renowned Chinese navigator in the Ming Dynasty (1368-1644) traveled seven times to the Pacific Ocean, and brought peace and friendship to the African continent. In modern history, China and African countries have supported each other in their national liberation movements and deep friendship has been nourished since then. Every year, performing arts companies from China and African countries have toured each other's countries. 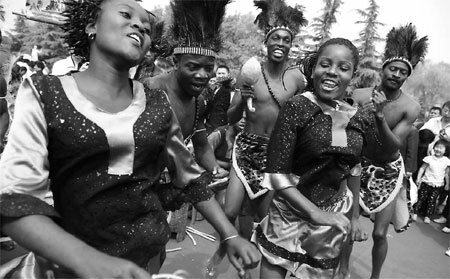 In 1996, Beijing Academy of Dance sent two choreographers to help establish a dance company in Cameroon and train dancers there. In recent years, many African countries have auditioned and sent kids to learn acrobatics at Wuqiao, the hometown of Chinese acrobatics. Chinese architects have designed and built museums and opera houses in these African countries. In July 1988, China set up its first overseas cultural center in Mauritius and two months later set up the Chinese Cultural Center in Benin. Today, among the seven Chinese Cultural Centers in foreign countries, three are in Africa (the third is in Egypt). These cultural centers provide information services, Chinese language and culture classes and regularly hold activities such as Chinese film shows, seminars, forums and performances. The Chinese Cultural Center in Mauritius has just finished re-construction and President Hu Jintao attended the ceremony yesterday to celebrate its re-opening during his visit to Mauritius. "President Hu highly values China-Africa relations, as good friends, good partners and good brothers," says Wang Hanjie, director of the division of African affairs, bureau of external cultural relations of China's Ministry of Culture. "And in the last three years since the Beijing Summit 2006, we've developed a very good relationship with our brothers. In future we would like to further the communication," Wang says. "The communication should reach up to high official levels, reach down to the grassroots and reach out to more fields," says Yu. According to Yu, government leaders of China and African countries will meet in Egypt in October to discuss the Action Plan (2010-12) of China-Africa Cooperation. Culinary adventures in north-east China.